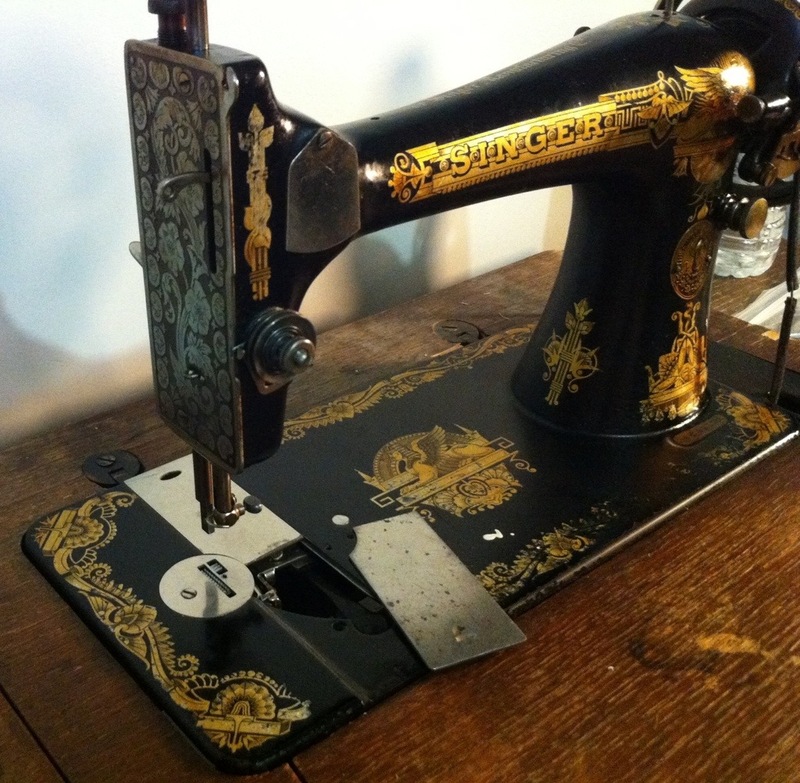 I was going to come up with some clever riddle about sewing machines, but then I decided I’d rather just get this post out. This is the treadle machine belonging to my husband’s family. As with a lot of heirlooms, it’s a bit tricky to say who it actually belongs to, but it currently resides with my Stylish sister-in-law, serving as a table for her Janome, which I’m happy to report is sewing just fine the vast majority of the time. was last used by Papa, Stylish and my husband’s great-grandfather, who, I am told, used it to stitch harness and tarps and other manly things. Before that, Nana (my husband’s grandmother) says it belonged to her mother, Papa’s wife, although I don’t get the impression she was a serious seamstress (Papa outlived her by a good forty years, hence the horizontal transfer of “ownership”). Nana seems to think it was likely a wedding present, as its manufacture date, 1924, is pretty close to the time of Papa and Kokum’s marriage. (For those hoping to date your own Singer machine, you can look up the serial number either on the Singer website or the ISMACS one. The machine lives in a rather plain but sturdy six (seven?) drawer cabinet. The cabinet is a bit beaten up, with veneer lifting on the top and the odd splash of pain over the surface. While the drawers contained many treasures, including plenty of thread, vintage zippers, and what I think is the never-used rolled-hem plate to my serger, it did not contain any accessories or feet for the Singer. 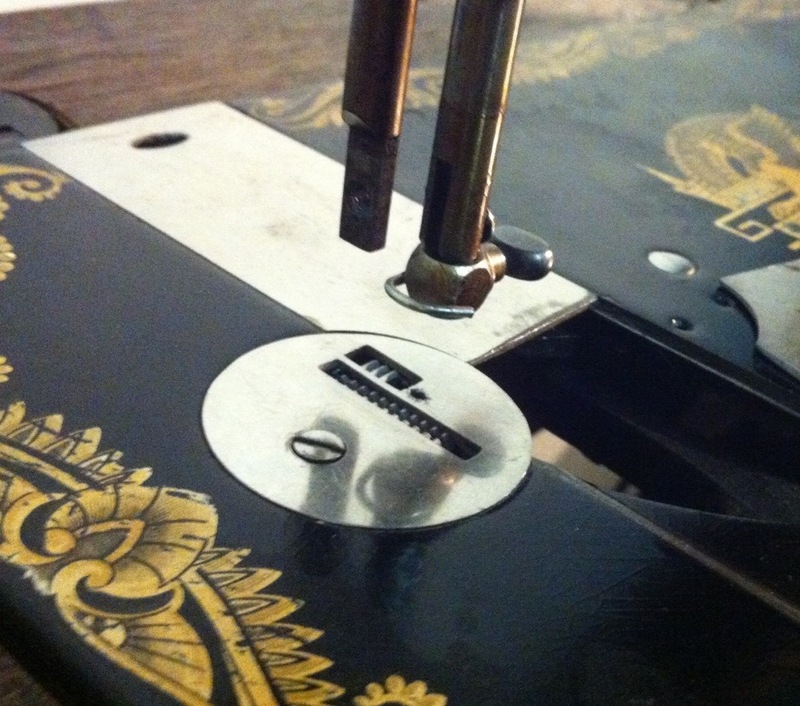 The single most obvious problem, when I first opened up the machine, was that it was missing a presser foot. It’s amazing how sad and deformed it seems, just lacking that one little detail. However, my sadness was swiftly relieved when I realized it took just a basic low-shank foot—much easier to find than a replacement for one of those top-clamping types. Anyway, injudicious application of WD-40 and judicious application of a mallet and wood dowel (AKA unsharpened pencil crayon) eventually got all the bits off that should come off (needle plate and the front and back slide plates). Unfortunately, the slide plates are really, really tight even after being wiped down; I tried to scrape along the grooves they fit into and clean out any gunk, and I oiled them, and I’m still afraid to put the front slide plate back in lest I end up unable to get it out without pulling out the hammer again. While things like the needle plate and the front plate on the left of the machine only really need to come off for cleaning (and there was really not that much crud behind either), the slide plates are how you get at the shuttle, which holds the bobbin, so really needs to be readily accessible. I’m not sure what to do about that—there’s no rust and doesn’t seem to be much gunk. For those of you as new to treadles as I am, this machine (like my Eaton’s Seamstress, actually) has what’s called a vibrating shuttle. Rather than a short, fat bobbin and casing that goes around like a wheel (OK, I know that’s a simplification), this is a long, thin bobbin and casing that goes back and forth. I’m assuming the rotary version is an improvement, although these vibrating shuttle models were still being made as late as the 50s. Anyway, after waiting three days to get at the shuttle, of course, I discovered that there was no bobbin within the shuttle at all. Curses! Now, this was not as simple as swapping in a foot from one of my other machines. 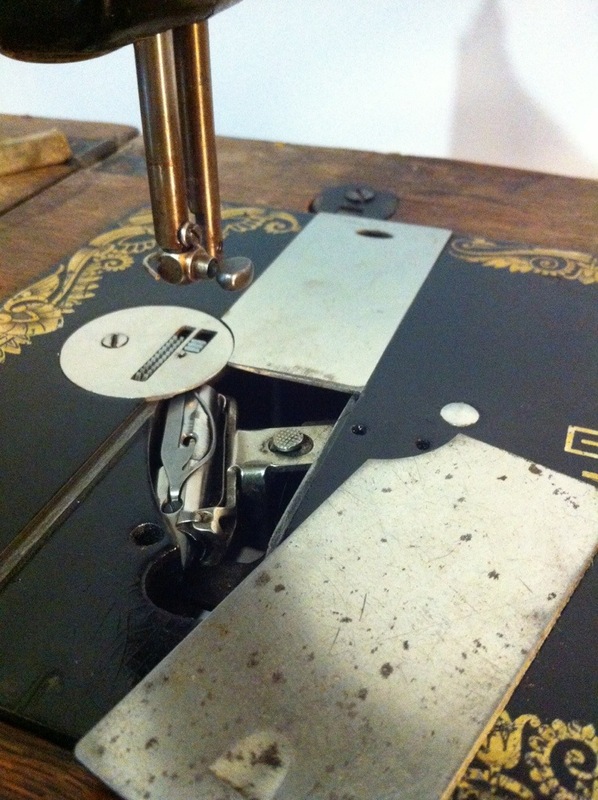 I learned to sew on a machine much like this one, and my recollection is that those slide plates were graduated imperceptibly in size, to keep people from putting them in wrong-way-round. You might try messing around with that. Oh, neat! Also, what a neat use for the base—I’d never thought of that, but I guess it is similar to a spinning wheel? I’d have been totally lost with this thing without the internet. I don’t think anyone in my husband’s family today still knows how to work it. What a beautiful machine. I love all the decals. luck luck luck luck luck. that would be very cool if you can get this to work. Yeah. I just realized I didn’t think to order a screw for attaching the presser foot. Durrrrrr. Well, that should be something I can get locally. 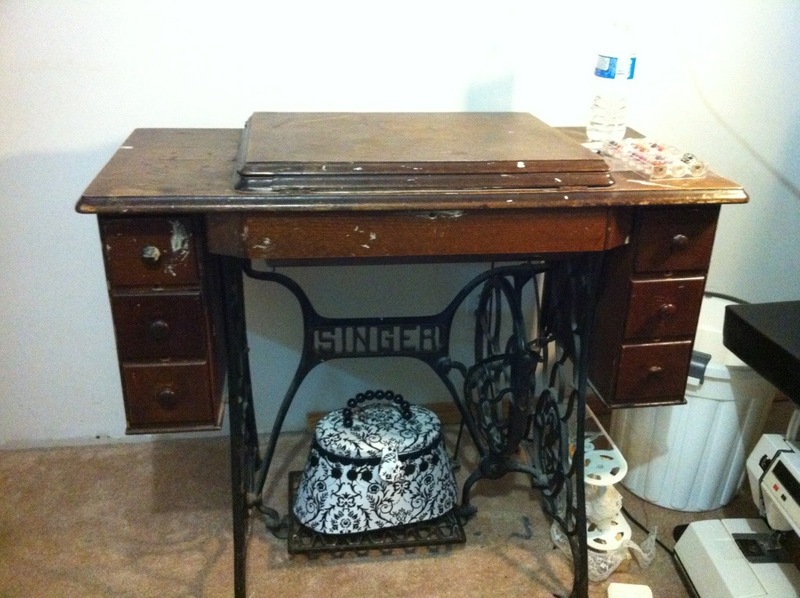 i have always wanted a treadle machine! 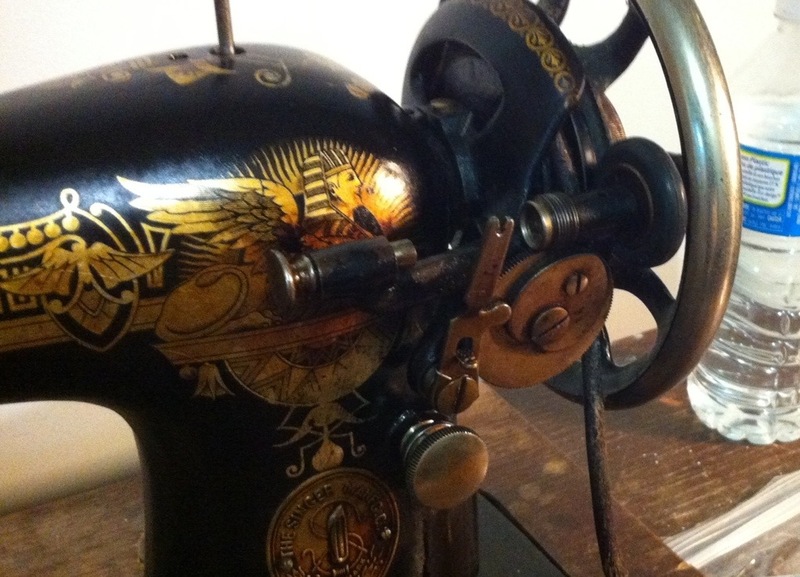 I learnt to sew on an old hand crank machine (From the 1870s), which my gran has now given me, but never a treadle. good luck in getting it up and running! I have an old New Home that is of a similar vintage and style, with an identical Singer cabinet…I’m hoping to build my own cabinet using the one I have as a template, because the machine itself worked as recently as about 20 years ago (it’s the one I learned on before being relegated to a leaky attic when the “new” machine was adopted). Needs a new belt though, mice ate the old one, and it doesn’t have any nifty accessories, just muddobber nests in the drawers. 😦 I may need to request your assistance when I start taking mine apart to see if it’s salvageable. Remember that show “Jericho” in which there is the post-nuclear American apocalypse? Ok, so I love those sorts of shows. In any case, there was one of these singer treadles in the corner of the old farm house and I was all “WHY IS NO ONE USING THAT! !” Indignant, that’s how I felt. I doubt the Elder Sewing Gods will be displeased since this is probably the first action that machine has had in decades. I never actually watched the show, but I remember its existence. Thanks! Any progress on yours? What lovely gold paint work? I love old machines but have thus far managed to avoid buying any. Mum has a hand crank singer of similar age with the same sort of shuttle bobbin which I learned to sew on. I don’t remember where it came from but it too has lovely gold paint work and such.